Michael Crabtree breaks free from Quintin Demps on his way to scoring a touchdown last week. Last week: The Redskins were embarrassed at home by the lowly Buccaneers in a 27-7 loss, but the more noteworthy events took place after the game when Robert Griffin III's press conference fueled headlines for days. 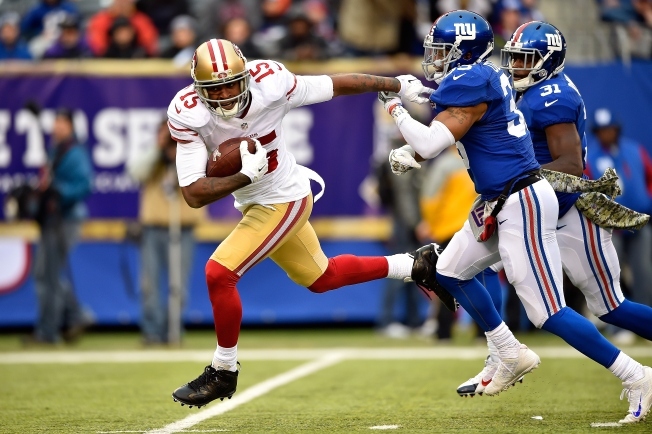 The 49ers quietly defeated the Giants 16-10. The first test won't be easy against the 49ers, whose defense leads the NFL with 16 interceptions. Perhaps Washington's best chance to win is if San Francisco looks ahead to division rival Seattle, which it plays twice in the 18 days following Sunday's game. Statistic of the Week: The 49ers have forced eight takeaways in their past two games, seven of which have been interceptions; San Francisco picked off New York quarterback Eli Manning five times last week. "I think it was a mistake on my part. After a loss like that, we're very disappointed in the way we played, and the question came up. ... I just answered it, the first thing that came to my mind, and sometimes the first thing that comes to your mind isn't the smartest thing, and it wasn't the right thing to do on my part. "Corrections should be in-house with everybody involved. The play speaks for itself, the production on the field spoke for itself. I didn't have to really elaborate on any individual fundamental things." - Coach Jay Gruden apologizing for his Monday remarks when he pointed out Griffin's "fundamental flaws"